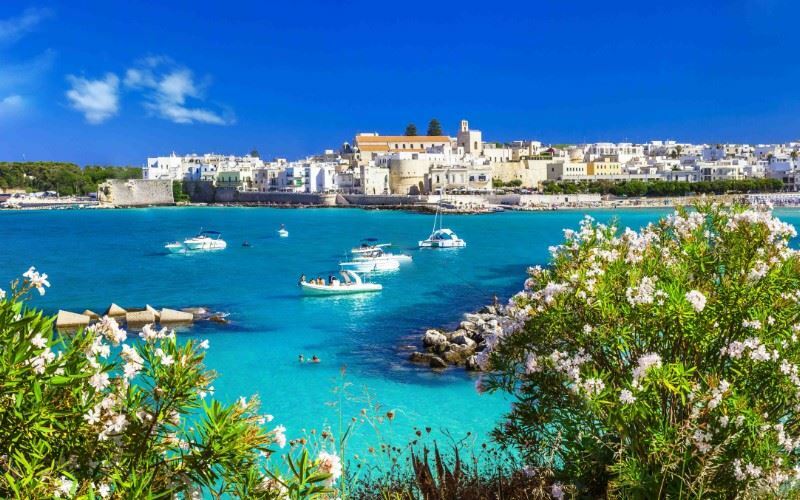 Puglia, which forms the heel of Italy’s boot, is the long, narrow region of southern Italy bordering the Adriatic Sea and the regions of Basilicata, Campania and Molise. Beautiful beaches, secluded coves, fields of olive and citrus groves, Baroque towns, whitewashed villages and fascinating conical-shaped trulli houses are just some of the many attractions to be discovered in the region. Arrive at Bari airport, collect your hire car and drive to your hotel in Trani (41km). Overnight at the Mare Resort. Day at leisure – spend the day exploring the historic city of Trani. Formerly a prosperous trading centre with a large mercantile and Jewish community, Trani was important enough to compete with the domineering Venetians in the 14th century. A wander through the streets gives an impression of the medieval city, not least in the names that echo the town's mercantile and Jewish origins – Via Sinagoga and Via Cambio (Street of the Moneychangers). The city centre bursts with activity in the evenings when locals pour into the town's excellent restaurants and wine bars, most of which are concentrated around the port. Day at leisure – Head north to the Gargano National Park (207km / 2 hours 20 minutes) which contains several protected areas such as the Marine Reserve of the Tremiti Islands. The Gargano promontory consists of a wide mountain massif made up of highlands and several peaks (the highest point being Monte Calvo at 1,065m), projecting into the Adriatic Sea. Inland are the last traces of the Umbra Forest, the only remaining area in Italy containing the ancient oak and beech trees that once covered much of Central Europe. The park offers good walking trails and cycle routes; a glimpse of hundreds of species of animals including deer, foxes and birds; the religious sites of San Giovanni Rotondo and San Marco in Lamis; the castles of Monte Sant’ Angelo and Manfredonia and the majestic beaches at Peschici and Vieste. The variety of natural habitats, interspersed with expanses of cultivated fields, olive groves and vineyards, guarantees an ever-changing landscape and a path rich in unforgettable views and panoramas. After breakfast, drive south to Fasano (106km) and the Borgo San Marco. This fortified masseria is set within 450 acres of cultivated land and olive groves – the owners are major producers of extra virgin olive oil. Overnight at the Borgo San Marco Hotel. Day at leisure – a visit to Alberobello (16km), inscribed on UNESCO’s World Heritage list, is worth a visit. Home to more than a thousand trulli houses – whitewashed, conical shaped buildings built centuries ago as homes and tool stores, and typical to this region. In the afternoon, head to the walled town of Cisternino (20km). Set in the picturesque Itria valley in the province of Brindisi and, 1300 feet above sea level, this medieval walled city presents an opportunity to stroll back through time on worn, stone-paved lanes between ancient palaces, towers, shops and homes that are mostly still in use today. Here, you can stop and eat in restaurants that spill out over the pavements, shop in the local craft shops or simply take a few snapshots of this charming town. Day at leisure – spend the morning sun bathing on the Adriatic coast (2km). Mile upon mile of wide sandy beaches are within easy striking distance. In the afternoon, visit the hilltop town of Martina Franca (16km), located in the Valle d’Itria between Bari and Brindisi, with its Sunday antiques market and annual summer classical and jazz festival. The town has a beautiful historical centre surrounded by stone walls, with prominent Baroque gates that lead to piazzas and narrow medieval streets. After breakfast, drive (93km) to the Patria Palace in Lecce. In the afternoon, head towards Porto Cesareo (28km), located on the southwest coast of Puglia facing the Tyrenhenian Sea. This is a beautiful seaside resort, famous for its 17km of golden sand beaches. There are several well-preserved watch towers located in the area including the Cesarea, Chianca and Lapillo towers, which are definitely worth visiting. The towers recount a historic period when the Saracen raids from the sea represented an almost constant danger to the population of the Salento. Overnight at the Patria Palace Hotel. Day at leisure – spend the day exploring Lecce. Affectionately known as the ‘Florence of the South’ due to its many Baroque buildings, Lecce has a Roman amphitheatre, more than a hundred churches and palaces and several designer boutiques. The city’s heyday was when it was part of Spain in the 17th century and the noblemen, merchants and religious orders of the city competed with each other as to who could build the most palaces. Carved from the local golden sandstone, the exuberant architecture looks like a sumptuous theatrical set. Day at leisure – head across to the Adriatic coast and the town of Otranto (48km). Located on the east coast of the Salento peninsula, Otranto is a jewel of a town. It has a bustling seafront area and many architectural gems such as the 15th century Castello Aragonese and the Cathedral. Wander through the alleyways of this historic town, passing white-washed houses and many pretty piazzas where you can sit and watch the world go by. Spend the morning in Lecce for a spot of last minute shopping before heading back to Bari airport (163km) for your flight home. This charming hotel is set in the historic centre of Trani opposite the port with its colourful fishing boats and seaside promenade. Palazzo Telesio - a grand 18th century building, has a rooftop terrace with panoramic views where guests can dine on the local cuisine at the Terrazza restaurant. The hotel also has a fascinating collection of coaches belonging to the Telesio family since 1956. Guests can walk or cycle to the nearby beaches or even take the shuttle bus or, explore the area by train or car. Borgo San Marco Hotel, a fortified 15th century masseria (farmstead) set within 450 acres of cultivated land and olive groves. Borgo San Marco, a fortified 15th century masseria (farmstead) set within 450 acres of cultivated land and olive groves, is the family home of Alessandro Amati, a major producer of extra virgin olive oil. The owner has retained many of the features of the original buildings, including vaulted ceilings, arches and the original, local stone ‘Pietra di Lecce’ flooring. This charming property offers comfortable and intimate guest rooms, simply furnished and decorated with antique pieces, in quiet and refined surroundings. The sandy beaches of the Adriatic coast are within a 2km drive. Minimum stay: 4 nights in July and 7 nights in August. The Patria Palace is a prestigious hotel housed in a fabulous 17th century palazzo in the heart of Lecce – dubbed the ‘Florence of the South’. The Patria Palace is a prestigious hotel housed in a fabulous 17th century palazzo in the heart of Lecce – dubbed the ‘Florence of the South’. This historical building, overlooking the fabulously ornate Baroque façade of the Basilica of Santa Croce, is located in a small square close to all the important monuments of the city. The buildings, mostly Baroque in style, flourished in the city due to the abundant supply of local stone ‘pietra di Lecce’, a pliable, white material which artisans could easily carve. The hotel still retains some of its original features including vaulted ceilings and carved balconies. The bedrooms, each with original decorative paintings, offer comfortable lodgings with modern facilities. All rooms will accommodate an extra bed for an adult or child, except for the superior rooms.